It's Facebook Fridays! for December 25, 2015. 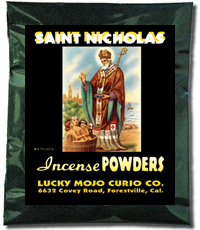 Today, the Lucky Mojo Curio Company celebrates the Twelve Days of Christmas with a special giveaway of 12 packages of our hand-made Saint Nicholas Incense Powders! First thing tomorrow morning, we will select TWELVE winners at random, announce their names here, and ask them to message this Facebook Page with their mailing addresses, so we can send them their FREE Saint Nicholas products. We have a winner! In fact, we have 12 lucky winners! Our Facebook Fridays! winners for December 25, 2015 are: John Deal, NinaCarmen Monroe, Genie O'Brien, Jeanine Davis, Dena Ruonavaara, Katie Pfeiffer, Claudia Immerzeel, Shawna Parker, Scottie Lee Williams, Noelle Peavy, William Copeland, and Angela L Brown.